Final Fantasy XIII Xbox 360 and PS3 Shots Doctored? Last Friday, a PR firm operating on behalf of Square Enix released a fresh batch of Xbox 360 and PlayStation 3 screenshots for upcoming action-fantasy game Final Fantasy XIII. Nothing unusual about that, but what no one expected was to open each consoles' folder and discover two sets of indistinguishable screens--identical pixel for pixel. The only difference in two sets of mostly battle shots? 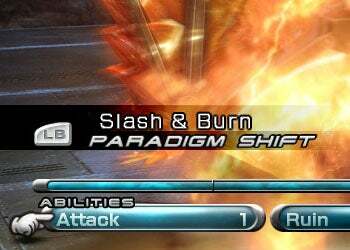 The "paradigm shift" interface button overlay, which displays either an Xbox 360 'LB' shoulder-button trigger, or the PS3 'L1' equivalent. Since we know that the Xbox 360 and PS3 versions aren't pixel-identical--each was developed using a unique visual engine--it's reasonable to assume the following: That prior to releasing these screens, someone doctored them, taking a single screenshot from who-knows-which-version and Photoshopping the 'LB' or 'L1' buttons in. The button overlay in the Xbox 360 screenshot. The button overlay in the otherwise pixel-identical PS3 screenshot. 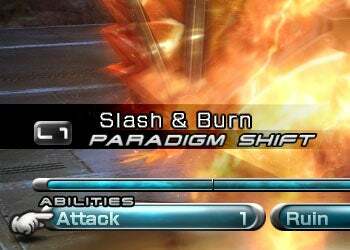 "We are looking into how the #FFXIII altered screens ended up in our presskit & will update asap," wrote Square Enix's Sonia Im in a Twitter update. "This was obviously not intentional. Aside from easily being proven as altered, and this method not being one we use, we don't feel there is a need to enhance the X360." "These were not meant to be released as a comparison of FFXIII on the two consoles," she wrote, explaining that the X360 batch in the distributed press kit was the wrong one and adding that the company would "have a statement shortly." Publishers rarely release multi-platform screens culled from analogous scenes for any number of reasons, but mostly to keep compulsively nitpicky gamers from bogging down in graphical minutia. Pose similar shots from two different consoles these days and you're practically bear-baiting. Recent previews of the game haven't helped, with critics making vague, technically unqualified claims about visual differences between versions.